5 best emergency apps and other emergency things your phone can do! Bad things happen to good people. It’s been that way for the entirety of human history and that won’t change long into the future. Thoughts and prayers are nice, but they don’t help in the event of an emergency. Your smartphone, on the other hand, can help. In most cases, nothing beats the power of a phone call or text. It’s the fastest way to get a hold of authorities or loved ones in the event of an emergency. However, there are some apps and other methods to help as well. Here are the best emergency apps and other emergency things your phone can do. Your first step in any emergency situation is to call your country’s emergency line and request assistance immediately. Here are some more apps that you might find useful! 10 best hurricane tracking apps and other helpful apps for hurricanes! Emergency is, well, an emergency app from the American Red Cross. It works in both English and Spanish languages. That makes it a good choice for basically any North Americans (except French Canadian, obviously). The app features a variety of alerts, including basically any disaster situation you can think of from inclement weather to earthquakes and wildfires. It also has a built-in flashlight, strobe light, audible alarm, and a map of nearby Red Cross shelters. It even has Android Wear support if you need that. The American Red Cross also has specific apps for things like hurricanes, earthquakes, first aid, pet first aid, and plenty of others. We highly recommend checking those out. First Aid Emergency is a simple app for emergency situations. You can find first aid information regarding asthma, bleeding, broken bones, burns, choking, diabetic-related complications, general injury, general distress, and even more serious things like a heart attack. It obviously won't replace the need for a doctor, but it may help until medical transport arrives. In addition, the app includes illustrated guides and other resources. It's free with advertising. The ads are a little annoying, but the app works. Medical ID is one of the better emergency apps. It covers the basics like ICE information, medical contacts, emergency, and other such things. You can also add things like birthday, allergies, blood type, and current medications. The app also features a persistent notification on the lock screen in case emergency services need to see it. This one is best for those with chronic illnesses or unusual conditions or allergies. It also has a premium version with more features and some delightful Material Design. ICE is another emergency app with a persistent notification. This one is a little more modern and simple than the other one on this list. You open the app, input all of your information, and then turn the app on. It keeps a persistent notification available in the lock screen and in the notification shade. The notification shows your emergency contacts, blood type, allergies, and other stuff. All of the features are available for free. It's a good, simple app for what it does. Who says emergencies have to take place in well populated areas with cell reception? 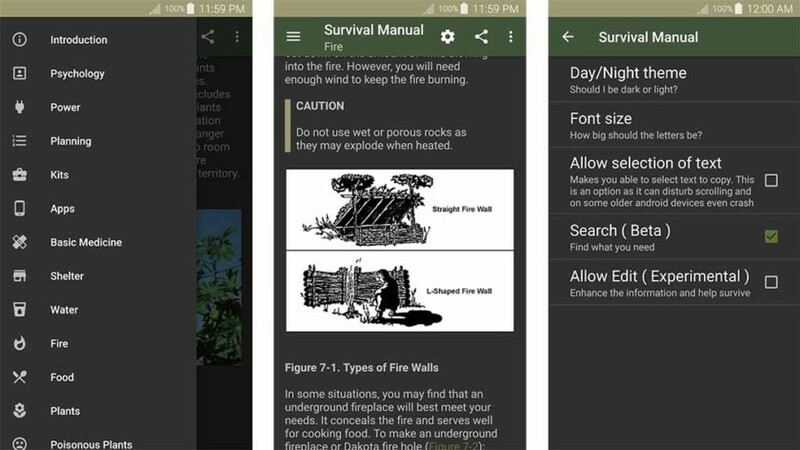 Offline Survival Manual is probably a niche app for a list like this, but we really like it. It is basically a field manual with all kinds of information. That includes how to make shelter, what kinds of plants to avoid, how to make fire, how to prepare food, and even basic medicine. This could be a great app for someone stuck out where they can't get cell reception and may need to fend for themselves for a little while. We're willing to bet Tom Hanks had this app on his phone when he got stranded with that soccer ball. In any case, this app is entirely free with no in-app purchases or ads. Check out some more helpful apps! Let’s get the obvious one out of the way. Your very first move in an emergency situation is to get a hold of emergency services and then your emergency contacts. This assures that help arrives at its earlier opportunity. We honestly don’t recommend messing around with some app when your life could be on the line. Nothing listed above is as fast or effective as simply calling 9-1-1 and getting the authorities to your location as soon as humanly possible. For now, calling the authorities is the fastest route. However, the FCC is implementing rules to let people text 9-1-1 as well. These types of changes also exist in other countries. We recommend familiarizing yourself with your country’s emergency numbers, protocols, and options when it comes to contacting them. Both major mobile operating systems have emergency stuff built-in. Android has a neat ICE available right from the settings menu. The location changes from phone to phone due to OEM modifications. However, every phone with Android Nougat or newer can save your emergency contacts and medical information. The information is available straight from the dialer. That’s great news because the dialer is available even if your phone has an active lock screen. iOS also has a similar service in its settings menu. However, admittedly, the iOS one has a few extra features. This includes an auto-call function. You can press the sleep button five times in rapid succession to call emergency services immediately. It does need to be activated in the settings menu first, though. In either case, we recommend taking full advantage of both iOS and Android’s ability to save your medical and emergency info since both are available in basically the same spot. It’s also worth noting that most phones can make an emergency phone call whether or not they have active, paid service or a SIM card. It may be worth taking one of your older devices and stashing it somewhere just in case. We could drone on and on about various tactics and ideas. However, the best bet is to sit down with your loved ones and concoct your own plan. The best plans for families are ones that integrate well with whatever services and devices they already use. Why make everybody download a new messenger app when the one you have works fine? It’s easier to implement new things if it doesn’t change the way your family behaves on its own anyway. Having a family unit that is well educated in emergency services may save their lives or, someday, maybe even yours. Enable battery saving mode for elongated emergencies. You don’t know how long the power will be out after a hurricane or how long it’ll be before you reach another power outlet. Don’t blow your battery load on silly things like syncing your email. Power save modes turn that stuff off to keep your battery from draining too quickly. Additionally, we can’t recommend external battery packs enough. They’re relatively inexpensive and can provide some much needed power. Most of them fit in a backpack or even a pocket in some cases. It’s not difficult having one around at all times. In case of violent situations, put your phone on silent or use Android’s native Do Not Disturb mode. You don’t want a phone call, text message, or other notifications alerting attackers to your presence. That Snapchat message can wait. Use your connections to the best of its advantage. The phone towers may be down, but that doesn’t mean your WiFi is (and vice versa). Use other tools on your phone. Every phone these days has a camera flash that is usable as a flashlight. GPS can help authorities or loved ones pinpoint your position or help you navigate to safe spots within your city. Find apps that help with basic stuff. An offline survival guide for wilderness emergencies, a knot-tying guide on YouTube, etc. There many first aid apps on Google Play with basic procedure for choking and other such issues. These are fringe cases, but why not cover as many bases as possible while we’re here? Use your camera to take images and send them to authorities (or emergency contacts) so they know what’s happening and where. However, we only recommend you do this if you can do it safely. Use common sense. Emergencies can be frightening. People get amped up on adrenaline and do all kinds of dumb stuff. Don’t be like them. Thank you for reading! Here are some apps for wilderness stuff! If we missed any great emergency apps or emergency ideas, tell us about them in the comments! You can also click here to check our our latest Android app and game lists!